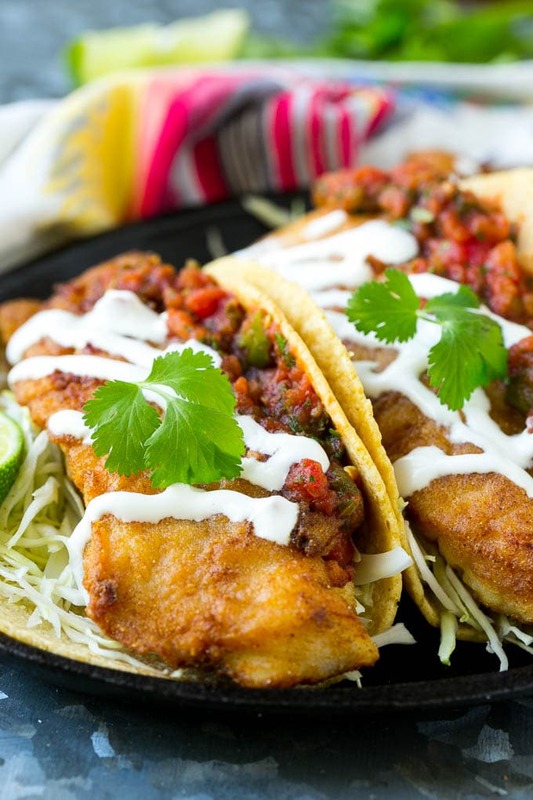 This recipe for Baja fish tacos is crispy fish fillets with cabbage, salsa and creamy sauce, all wrapped in warm corn tortillas. Just like you’d get in a restaurant, except better! I love to make my own tacos at home, it’s quick, easy and everyone adores them. I serve my tacos with a side of pinto beans and rice and Mexican Caesar salad for a complete meal. I went to college in San Diego, and even though I haven’t lived there in years, there’s one culinary delicacy that I miss: Baja fish tacos! You can find them everywhere in the San Diego area. This recipe is my take on the classic Baja fish tacos, and it’s perfect for a family dinner, Lent or for those times when you just want an exceptional taco. What is in a Baja fish taco? Baja fish tacos are typically comprised of crispy fried fish, shredded cabbage, red salsa and white sauce, all inside a corn tortilla. Sometimes you’ll see other variations like the addition of guacamole, or use of green salsa rather than red salsa. What fish is best for fish tacos? I recommend using a mild white fish for these tacos, such as tilapia, halibut, cod or mahi mahi. In this case, I’ve used tilapia because it’s readily available and inexpensive. You’ll want to cut your fish into strips to fit inside your tortillas. How do you make Baja fish tacos? The first step is to fry up your fish. I use a seafood breading mix to make life easier. 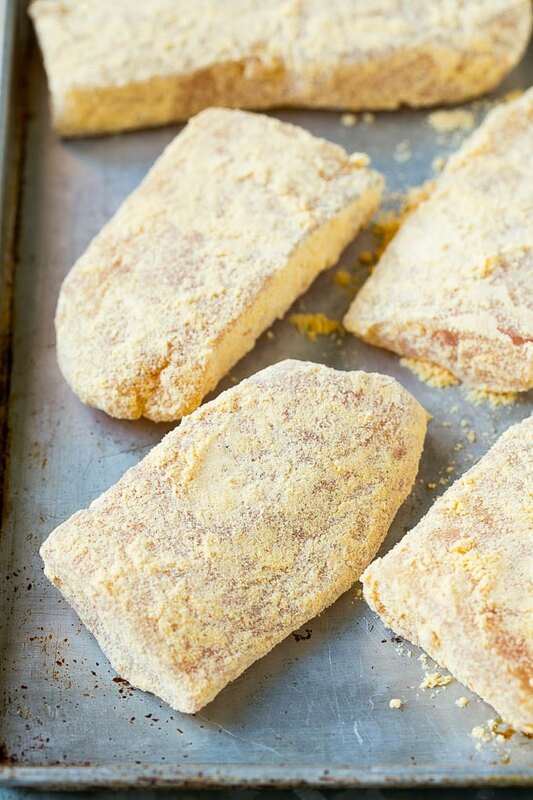 You can find a seafood breading mix near the breadcrumbs at your grocery store. 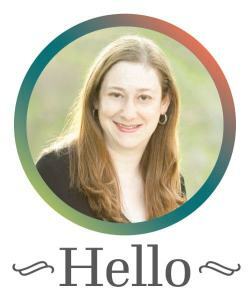 There are a few different brands to choose from, and I tend to prefer House-Autry Mills. 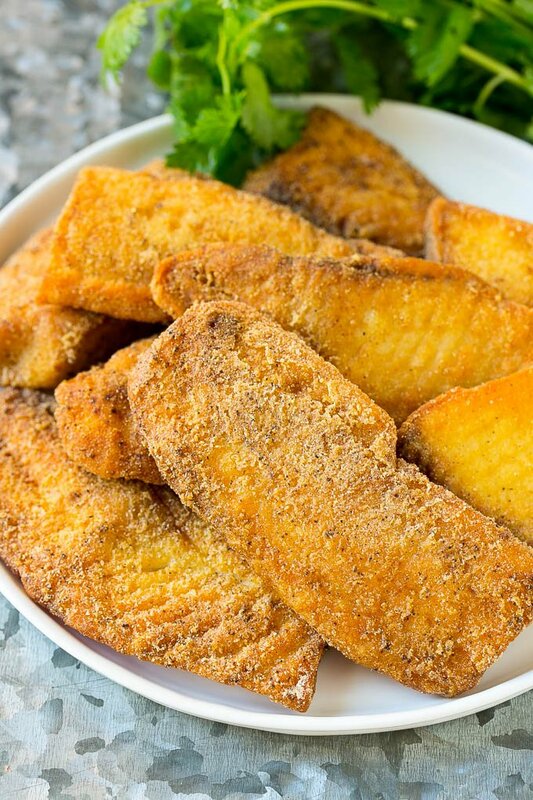 You can either deep fry your fish, or fry it in an inch or two of oil in a skillet. While the fish is cooking, I prepare the rest of the components for my Baja fish tacos by shredding the cabbage and making the sauce. The creamy white sauce is what really makes these Baja style tacos stand out from the rest, and it couldn’t be any easier to make! It’s simply a mixture of plain yogurt and mayonnaise that’s seasoned with salt and pepper and thinned with a little water. I also use a store-bought fresh salsa to go onto my tacos. What toppings do you put on fish tacos? While these Baja style tacos include just a few toppings, you can absolutely add other toppings to your liking. Here are some of my favorites. Avocado: Sliced or diced avocado, or guacamole. Cheese: Shredded cheddar or crumbled cotija cheese. Chiles: Roasted mild green chiles or thinly sliced jalapenos. Herbs: Chopped cilantro or sliced green onions. In my opinion, these fish tacos are perfection – the crispy hot fish pairs perfectly with the cool cabbage and creamy sauce. While corn tortillas are traditional here, if you’re a flour tortilla fan, you can substitute them in with great results. 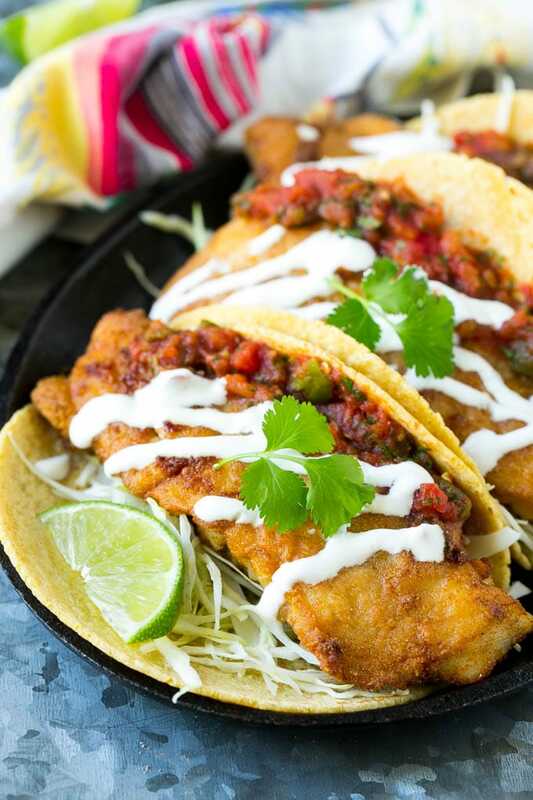 Whether you’re following a meat-free diet for Lent or feeding a crowd for dinner, these Baja fish tacos are sure to be a big hit! Taco Tuesday will never be the same again. 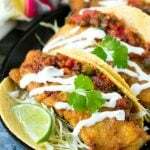 This recipe for Baja fish tacos is crispy fish fillets with cabbage, salsa and creamy sauce, all wrapped in warm corn tortillas. Just like you'd get in a restaurant, except better! 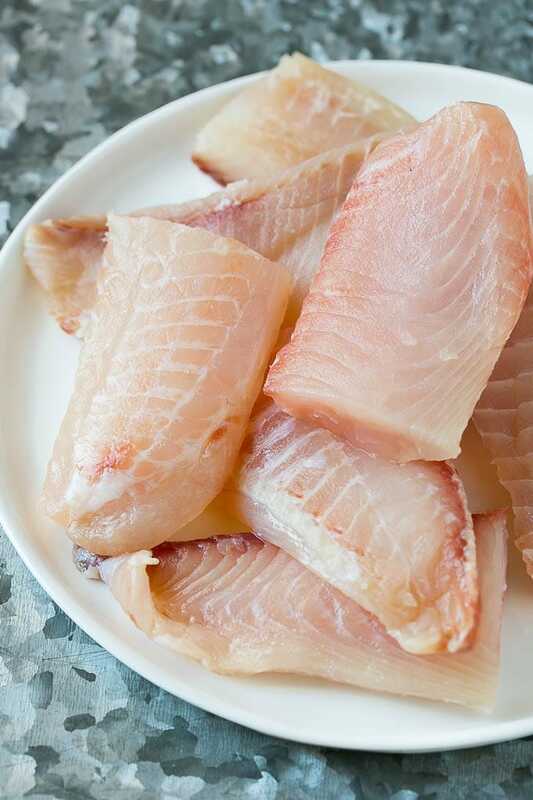 Brush water over the pieces of fish. Sprinkle the fish with salt and pepper. Place the seafood breader on a plate. Roll each piece of fish in the seafood breader until completely coated. Heat the oil in a large pan over medium high heat. Add the fish in a single layer and cook until deep golden brown, 3-4 minutes per side. You may need to cook the fish in batches. While the fish is cooking, make the sauce. In a small bowl whisk together the yogurt, mayonnaise, water and salt and pepper to taste, set aside. To assemble, place 2 tablespoons of cabbage onto each of the 8 tortillas. Add a piece of fish on top of the cabbage. Add 1 tablespoon of salsa to each taco, then drizzle the white sauce over the top. Serve immediately, garnished with cilantro and lime wedges if desired. This post was originally published on March 23, 2017 and was updated on January 6, 2019 with new content. This post is sponsored by House-Autry Mills. Thank you for supporting the brands that make Dinner at the Zoo possible! These tacos look great! Great way to change up Taco Tuesday! I’m always up for fish tacos! These look great! Oh my goodness! This is the only my kid will eat fish! So yummy! We love fish tacos and these look fantastic! These would disappear in our house! These are just so adorable!! This look beyond delicious! This will quickly disappear on our table, can’t wait to give this a try! Love a good fish taco! I absolutely love these. They look so amazing !! Great recipe! I added cilantro and lime juice to the sauce!